If Bekele Gerba thinks (like he claims sometimes) that people need to be administered by their own elected representatives without any body from outside interfering with the internal affairs of the concerned people, then he should also be the first person to recognize that he needs to go back to Dembi Dollo or Gimbi or any other monder he is from in Wollega and be representative there and only there and has got no business in Addis Ababa issue to bake. I don’t think he is even a resident of Addis. Why interfering in Addis Abba issue different from interfering in other people’s internal affairs? He was also challenged on an tv-interview I heard on the internet on the premise that if qeerroo is not a legally recognized political body (without a legal status) but still allowed to interfere with the affairs of the people, then the so called Baldras, which is also without legal status so far (as far as we know at least), should also be allowed to interfere itself with the affairs of the people, isn’t it? Get the basics straight first, before aspiring to become a politician, unless you are driven by some sinister motive(s). Is he not supposed to be educated,I once long time ago heard him speak and liked him,why the change? Could it be that Ato Bekele Gerba speaks as the leader of a party (ONC) that represents the whole of Oromos or Kilil Oromia? As far as we know, Addis Ababa - at least the land it sits on - is part of Oromia. Consequently, he has every right (simply for being an Oromo) & even legal legitimacy (for being the deputy leader of the ONC) to express his views on issues that concern the Oromo people. The argument defend the truth made is reasonable. But I take an issue with Bekele Gebra not messing with the politics of Addis, as Defend alludes, because he might be a resident of Dembidolo or Gimbi. Well, he had been born there. He used to teach however in AA university, but I do not know his current status. That means he is a resident of Addis. Yes, Bekele has the right to say whatever nonsense he is saying about Addis. Eza leminoru erdataw ayleyachew.yehe hulu rucha yehe hulu ye sew bezat. If your claim is that Ato Bekele speaks in the name of a political party, then that alone makes the burden of responsibility more, not less, on him to handle without a double standard. Moreover a self autonomy means having local administration of the people, like a village court, locally collecting the taxes to reinvest into the local economy/infrastructure and so, and if that is the case, then there should be a uniform application of the principle all over the places they claim to represent as political parties. If qeeroo has got no legal status what so ever and still enjoys the political endorsment of the political parties trying to handle in the name of the people, then there is no ground for them to condomen another "organisation" (if it may be called so) of the same status to have handled differently, isn't dabballe kid? could you please say few of the things that he spoke and you liked him then? Then we can find out if it was you who rushed to liking him (falsely) or it was he who was trying to mislead people, I think. You're trying to split hair & arguing against the obvious. All we need to agree on is that Bekele Gerba is entitled to make a comment on Finfinnee/Addis issue. Yes, 'Daballe" refers to kids but according to the rules of the Borana/Oromo Gada system, 'Daballe" refers not just to all kids but to those found on the 'Daballe Gada Garade/class" or age bracket. That is: not all kids are Daballe but all Daballe are kids . Their unique hairstyle known as 'Guduruu" (as in the name of a region in Wollega named 'Horo-Guduruu') defines them as 'Daballe Kids" &, on that basis, people accord them special treatment. They are seen as a blessed lot & capable of giving people good omen or good luck. Generally there are 8 Gada age grades or classes among the Oromo but this varies a bit from regions to regions as some groups combine some age groups or classes. Among the Borana & Guji Oromo communities of southern Ethiopia, there are 11 Gada age groups or classes & these are: 1) Daballe (age 0-8); 2) Junior gamme (gamme didiko/xixinno) (age 8-16); 3) Senior gamme (gamme jajjaboo) (age 16-24); 4) Kuusaa or junior warriors (age 24 -32), 5) Raabaa Doorii (age 32-40); 7) Gada (age 40-48); 7) Yuba 1 (age 48 to 56); Yuba 2 (age 56-64); 9) Yuba 3 (age 64-73); 10) Gadaamojji (age-72-80, terminal age group for praying and working for Peace); 11) Jaarsa (age 80 & above, retirement). photo: here are Daballe kids dressed in 'salvage' clothes imported into Ethiopia via Kenya. 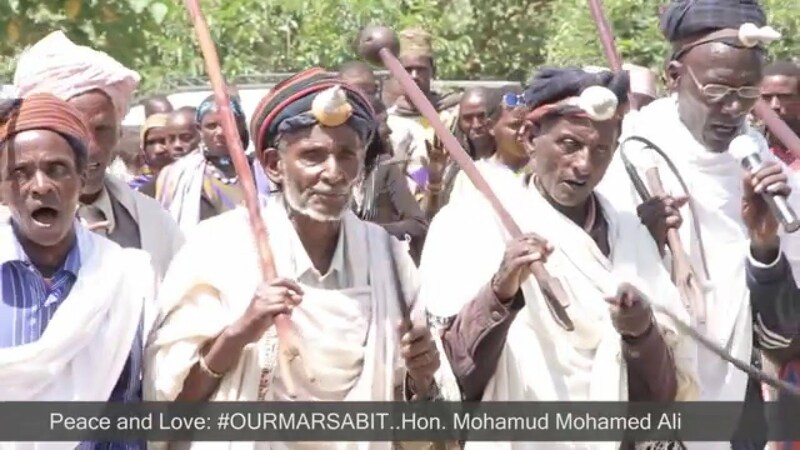 photo: a Borana-Oromoo elders assuming a "Gadaamojji" stage of life in a 'Gadaamojji festival".